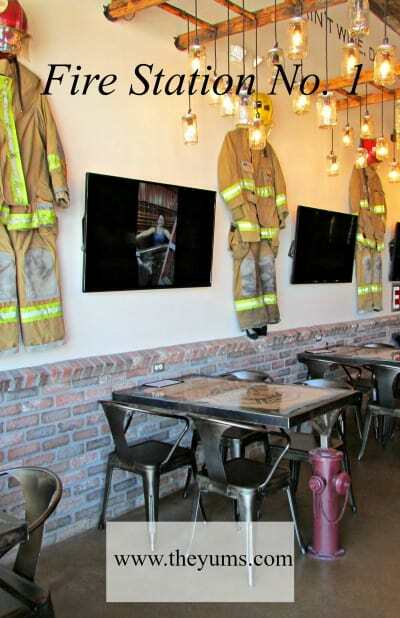 From the outside, the red brick building is unassuming but step through the side door and BAM, you’ll be struck by the ‘wow factor.’ Fire Station No. 1, is a bonanza of all things firefighter. The building started life as a movie theater in the 20s, becoming the first fire station in 1954 where it remained until 2006. Over the years, as firetrucks increased in size, they could no longer fit through the doors of the fire station. The city built a new one, and this fire station became a storage center and eventually sat vacant for years. Enter local 5th generation distillers and restauranteurs, Zip and Chris Lucidi. When they purchased the building in 2016, their goal was to honor its rich heritage by keeping the fire station theme. Zip and Chris did all of the renovation themselves; the two also built the tables, chairs, ladders, and the distillery room. Reclaimed barn wood from Kentucky covers the tasting room’s ceiling. An American flag made from fire hoses (by Chris) and donated firesuits and helmets (all with a story) adorn the walls. Look through the large windows at the rear of the tasting room, and you’ll be gazing upon the distillery. They worked quickly and were able to open Fire Station No. 1 in nine months. If you time it right, you can book a distillery tour and have lunch or dinner before or after. Location: 8307 W. Washington St, Peoria, . Menu: The owners believe in fresh ingredients; you’ll not find a microwave or freezer. The craft menu is simple. There are six appetizers including Firehouse Poppers and Station No. 1 Sidewinder Fries (divine). Handhelds include seven burgers and unique sandwiches; all come with Sidewinder Fries. The charcuterie board is a personal favorite: its a rotating selection of imported aged cheeses and dried meats “Liquor-laden” desserts vary by day and are homemade. Beverages include local draft beers, a vast array of signature cocktails using their spirits, and Arizona blended wines. Thoughts: We’ve always believed in supporting local businesses, and Fire Station No. 1 has become our local go-to. There is a sense of energy when you step through the door; it has a great vibe. On our first visit, we were impressed by the attention to detail both in the decor, and food. I don’t believe it’s possible to have an unpleasant dining experience here. Anything you order will be freshly prepared, and scrumptious. If you’re in the mood for a basic burger, order the Classic. Made with Angus beef, topped with American cheese, lettuce, tomatoes, onion and garnished with pickles, this humble burger is one of my favorites. If you aren’t in the mood for beef, substitute chicken at no extra charge. Served with their legendary Sidewinder Fries (prepared with a cracked pepper blend, fleur de sel, duck fat, and garlic confit), you might be tempted to order a side as I did. Happy hour is a bargain with half off all alcohol. Distillery tours are offered (check the schedule). The $14 price includes three samples and a cocktail. Price Range: Appetizers are $7-9, burgers and sandwiches $10-12, the charcuterie board is a reasonable $18. Local draft beer is $8, Arizona wines are $7 a glass. $9 will purchase a signature cocktail, Trauma Mary and Az Jackass Muel to name two. A bottle of spirits from the distillery will set you back $30-40. With clever names like Forcible Entry Vodka, Crooked Ladder Rum, and Dispatch Gin, you’ll be tempted to bring a bottle home.